John Thomas Shively, age 94, of Hazard, KY passed away on Nov. 08, 2018 at the Eastern KY Veterans Center. John was a United States Marine Veteran and a retired manager for Martin's Department Store. He was the son of the late Jim Shively and the late Cintia Jent Shively. He is also preceded in death by his wife: Lola Cody Shively; one son: Alger Bart Shively; one grandchild: Robin Childers; one great grandchild: Corey Childers; one sister and two brothers. 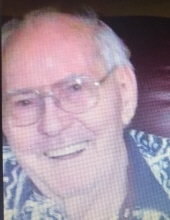 He is survived by one daughter: Johnnie Faye Wilson (Kenneth) of WV; two sons: William Tommy Shively of Clearfork, KY & Donny Shively of Vicco, KY; two grandchildren: John W. Shively & Bobby Hoskins II; two great grandchildren: Emily Shively & Ethan Childers along with a host of family & friends. To send flowers or a remembrance gift to the family of John Thomas Shively, please visit our Tribute Store. "Email Address" would like to share the life celebration of John Thomas Shively. Click on the "link" to go to share a favorite memory or leave a condolence message for the family.